This week I read Kenneth Schenck's magnificent little primer to Philo, A Brief Guide to Philo (Westminster John Knox, 2005), which has motivated me to face my Philophobia and wade into Philo's writings. I enjoyed reading In Flaccum and am now reading Legatio ad Gaium. I am surprised by some of the things Philo says, and I'm hoping that some of you Philo experts might be able to provide some guidance. Okay, here's my question (in bold), with some brief introduction: I think Schenck (and others) is right to approach Philo as first an interpreter/exegete of Israel's biblical traditions and also a philosopher, mystic (in a limited sense), apologist, etc. In other words, Philo remains a staunchly observant Jew committed to keeping Torah despite the thoroughly Hellenistic, even middle-Platonic expression of his Judaism. So how should we describe the tension between the following two observations from Legatio ad Gaium? One the one hand, Philo gives surprisingly straightforward and even glowing encomia of the demigods Dionysius, Heracles, and the Dioscuri (Legat. 77–92) and of the gods Hermes, Apollo, and Ares (Legat. 93–113) as part of his condemnation of Gaius Caligula. 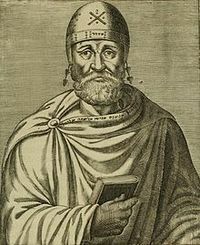 On the other hand, Philo acknowledges and even participates in the Jewish insistence "to acknowledge one God who is the Father and Maker of the world" [ἕνα νομίζειν τὸν πατέρα καὶ ποιητὴν τοῦ κόσμου θεόν; Legat. 114–18 (115 quoted)]. Notice that these are adjacent sections of Legatio ad Gaium; Philo goes immediately from lauding Greco-Roman demigods and deities (in contrast to Caligula) to expressing the fierce monotheism we often think more typical of second-temple Judaism. How do those more expert in Philo's thought and writings manage and/or resolve this tension, or am I seeing non-existent ghosts? I think the key issue Philo is trying to get across is that Gaius was choosing to emulate the Hellenistic deities for all the wrong reasons. Rather than the virtue that they were commonly known to represent, Gaius’ self-deification involved emulating qualities that made him look foolish. The admirable attributes Philo ascribes to the each deity show up throughout his work and are ascribed to human Biblical characters along with an abundance of virtue language attributed directly to God. Rather than looking at this as specific veneration of the Hellenistic deities (which I don’t know of any secondary source that posits this) it would be best to consider what he is doing here as a rhetorical move that sets up later discussion about virtue. I believe that using the Greek deities to illustrate specific virtues was commonplace during Philo’s time and didn’t necessitate a fudging of monotheistic convictions.